A chest is a wooden storage box. It can be used to store a variety of different items such as blankets and toys. When built or lined with cedar it allows for long term storage of natural fibers such as wool and cotton without concern for damage or infestation by moths. 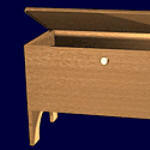 It is relatively easy to adjust the width, height and depth of most of the chests presented. The following chest, designs and instructions are free. Selection of manufactured storage chests . This chest is designed to perform two functions, that of a chest and coffee table. This provides storage in smaller living rooms. Blanket storage chest. Detailed plans and instructions. The leg sections require moderate wood working skills. 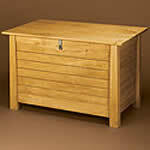 Storage chest is constructed out of cedar planks with oak trim. Minwax provides detailed instructions and drawings on the construction of a New England pine blanket chest. Only basic wood working skills are needed to complete this project. This relatively small pirate's chest is only 18″ x 13 1/2″ x 11 1/2″ and would thrill any young pirate living at your house. Very detailed pictures, drawings and instructions.